What a lovely way to honor your amazing grandmother! My heart goes to you and your family to have lost such a vibrant, loving force in your lives. your grandma reminds me of mine. long gone. 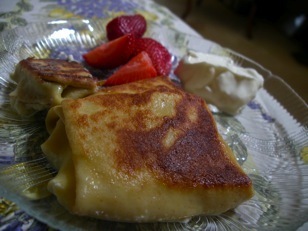 the blintzes look so delicious with those perfect crispy browned folds…thank you. and by the way, my mom makes farmers cheese. take a carton of buttermilk, put it in the oven at 100F for a couple of hours until the white mass separates from the liquid. pour through cheese cloth and hang to drain for a day or some. the result is farmer’s cheese. you can add salt, raisins and whatever else you like to it. 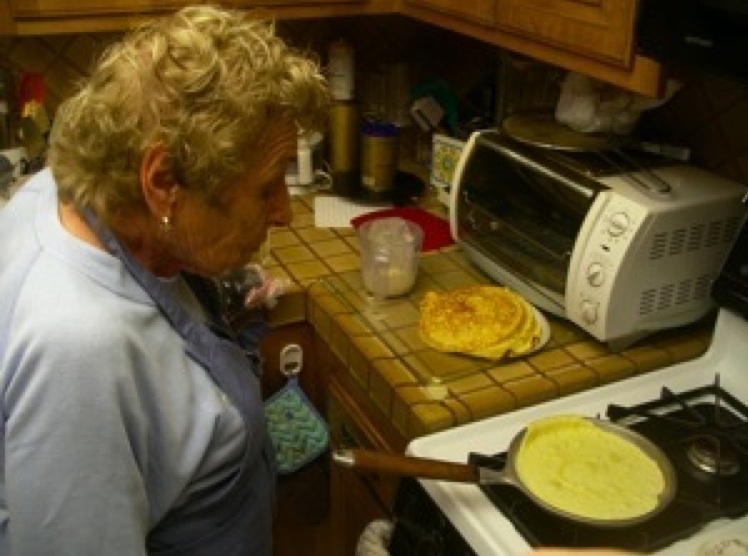 I got all teary when you said you were travelling with her strainer and blintz pan. Debs, where do you get farmer’s cheese? My mom has been having a hard time finding it the last few years. Esti, any cheese counter worth its salt should carry farmers cheese. Just ask for it. I just called the Whole Foods on Roosevelt and they have it. Also, one of the farms at the U-District farmers market carries it. I’m blanking on the name, but will get back to you. Barb, farmers cheese is a sort of crumbly, moist cousin of ricotta. ig, thanks for the instructions on making your own. Rachel, thanks for the kind words. I’m sure the TSA got a little confused when they scanned my suitcase. Confusing the TSA is a worthwhile endeavour in itself. 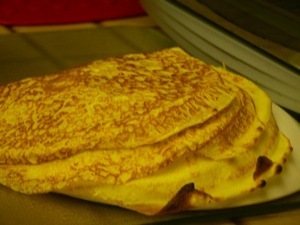 What a wonderful surprise to find this recipe for blintzes. 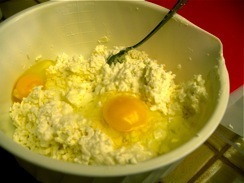 It reminded me of something my grandmother used to make for breakfast when she lived on a farm. I always loved them and could never duplicate them — my grandma was Polish and all the recipes were in her head — you know, some of this, a pinch of that. Bless her heart. Then I saw the picture of your grandmother, and the resemblance was uncanny — she almost looked like my grandma. I’m anxious to try this recipe, I think it’s what I’ve been looking for. Bless your grandma’s heart for writing this down to share with others. Thank you for sharing. Sandi, I’m so glad! It’s definitely a very particular recipe, and my grandmother always insisted any shortcut would make it not come out quite right. Please let me know how it turns out after you try it! If you’re having trouble finding farmers cheese — and I’ve discovered that apparently there are many different cheeses people refer to as such — go to a Russian or Polish store, or an international store that carries Eastern European ingredients. The one I got is a Russian brand. It looks like a much drier version of ricotta. 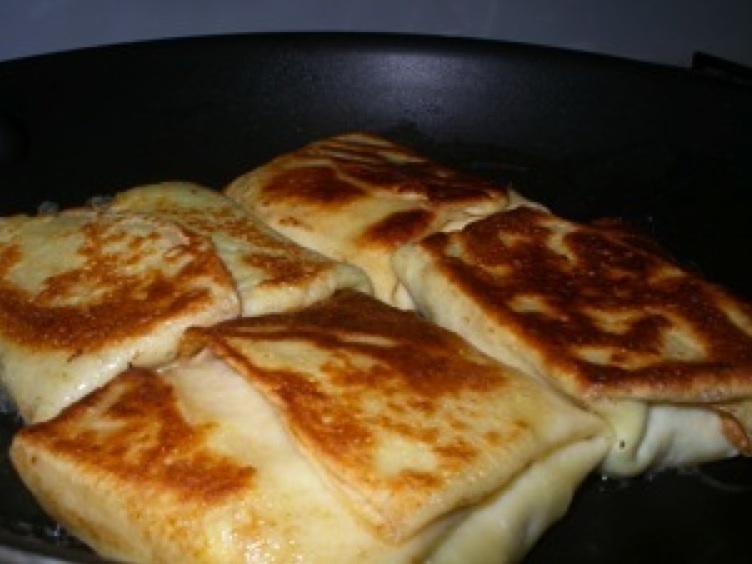 Making this recipe for Shavuot…..I am so looking forward to making these..and I will post a link to your site and this article. Thank you dear for honoring her and out heritage. Great to hear! 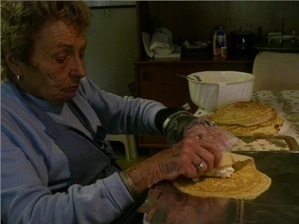 How did the blintzes come out?